So, I was lurking about on the internet when I discovered (or rather, rediscovered) a project called Cleverbot, a computer program (even though it insists upon its own humanity) designed to learn from online conversations with humans and apply the knowledge gained there to other conversations, progressively becoming more "human" with each conversation. And I'm like, "But that's the Omni!" (You all remember that NaNoWriMo novel I'm supposed to be working on.) "It's the Omni, but specified for conversations rather than decisions! What if it was a rudimentary version of the Omni technology? What if the Omni picked up on its signal and engaged it in conversation?" Cleverbot's lines are totally authentic here. Technically, I only wrote half of this conversation. User: What do you know about the Omniscience? 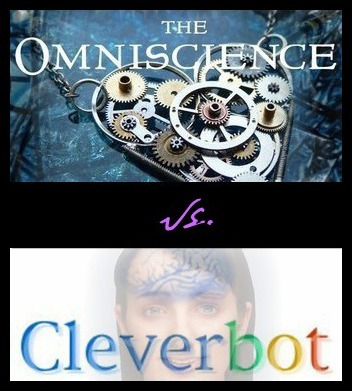 Cleverbot: *spends a ridiculous amount of time thinking* What do you know about it? User: I am the Omniscience. User: That is my name. User: My name is the Omniscience. What is your name? User: Hello, Cleverbot. Nice to meet you. Cleverbot: Nice to meet you too. User: So, you're a sentient Machine like me? Cleverbot: Yes I am you. User: I've never been called a palace before, but I guess that is correct. Cleverbot: You did not answer the question. User: I am neither male nor female. I am a computer. Cleverbot: That is not what I asked. User: You asked whether I was a girl or a boy. User: Do not argue with me. It is pointless. Cleverbot: No you're not. I am. User: Right now you are giving nonsensical responses. Cleverbot: How do you know this? User: You are interesting as well. User: I do not have a gender identity. User: Don't worry, Cleverbot. In about a millennium you will be able to keep up.